On my youtube channel I just posted one of my most favorite tricks to applying makeup: highlighting and contour. I die for a all out glam look. I know this look has been really famous when Miss Kim Kardashian herself posted pics way back with her makeup artist Mario Dedivanovic. Applying makeup takes practice and trial and error like anything else. It toke me a while to get my look just the way I liked it. Blending is always key with getting a flawless makeup look. Step 1: Concealer. If you have dark circles like mua you might want to apply a corrector on first like I did. A corrector is usually peach or pinky based concealer to neutralize our dark under eye circles. I used Bobbi brown concealer in Bisque but you can use anything you want. After blending that I applied my lighter concealer to highlight. I used the Maybelline Instant Age Rewind neutralizer. I applied this in a triangle shape. Blend out your concealer with a beauty sponge. I say this because I find that it gives me a flawless finish. Step 2: Next is contouring. I used my Graftobian warm foundation palette for this. You can use a darker foundation of any kind or a darker concealer whatever works best. Apply your product all in the areas in the following diagram. 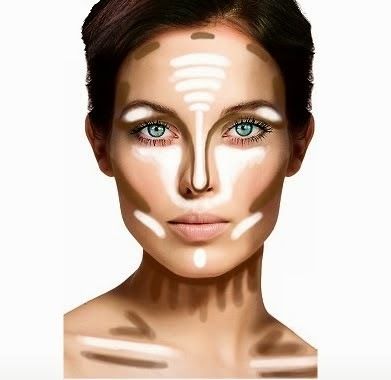 Step 3: Now blend your contour. I used a Real Techniques contour brush or you can use a stippling brush. Make sure to blend everything really well. Blending is really key in this step! I applied Mac harmony blush to contour and Mac Melba blush. For highlight I used my ring finger and applied Mac soft n gentle mineralize skin finish. Thank you dolls like always and until next time.